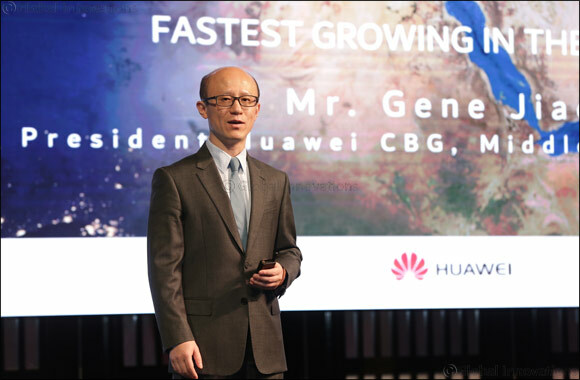 Dubai, United Arab Emirates – 20th September, 2017: Huawei Consumer Business Group today held a media open day in Dubai, UAE, to discuss the future of innovation in the Middle East region. This is a second stop right after IFA that was held in Berlin on 1st September. Led by Chief Marketing Officer, Huawei Consumer Business Group (CBG), Ms. Glory Cheung, and Mr. Gene Jiao, President of Huawei CBG, Middle East & Africa, the event highlighted the key innovations Huawei is driving in the consumer smartphone industry, both globally and regionally, as well as Huawei’s brand ambition to become a global iconic tech brand. “We see tremendous potential in the Middle East markets and are pleased to support the region’s agenda of fostering innovation” said Ms. Glory Cheung, Chief Marketing Officer, Huawei CBG. “Globally, Huawei is a top investor in R&D and we focus on bringing together the world's best intellectual resources to strengthen our innovation capability. This is to ensure we are constantly delivering intelligent innovations to enhance and exceed mobile experiences of our customers. We look forward to being a part of the region’s innovation agenda and continue to be its champion by brining cutting-edge technologies to the Middle East’s rapidly evolving digital arena.” Ms. Cheung reiterated Huawei’s commitment to fueling innovation and collaborating with leading partners to transform customers’ experience, as well as Huawei’s growing market share year-on-year. Mr. Clement Wong, Head of Global Product Marketing, Huawei CBG highlighted the company’s vision of the next frontier in mobile and introduced Huawei’s newest 970 Kirin - an AI powered Chipset. By combining the power of the cloud with the speed and responsiveness of native AI processing, Huawei has confirmed that it will unveil the Huawei Mate 10 series with Kirin 970 at an event in Munich on October 16. This was followed by an insightful presentation by Mr. Gene Jiao, President of Huawei CBG, Middle East & Africa focusing on Huawei’s expanding role across the region.